The Polar Satellite Launch Vehicle (Hindi: ध्रुवीय उपग्रह प्रक्षेपण यान), commonly known by its abbreviation PSLV, is an expendable launch system developed and operated by the Indian Space Research Organisation (ISRO). It was developed to allow India to launch its Indian Remote Sensing (IRS) satellites into Sun synchronous orbits, a service that was, until the advent of the PSLV, commercially available only from Russia. PSLV can also launch small size satellites into geostationary transfer orbit (GTO). As of 2014 the PSLV has launched 71 spacecraft (31 Indian and 40 foreign satellites) into a variety of orbits. Some notable payloads launched by PSLV include India’s Chandrayaan-1 lunar probe and the Mars Orbiter Mission. PSLV was designed and developed in the early 1990s at Vikram Sarabhai Space Centre near Thiruvananthapuram, Kerala. The inertial systems are developed by ISRO Inertial Systems Unit (IISU) at Thiruvanathapuram. The liquid propulsion stages for the second and fourth stages of PSLV as well as the reaction control systems are developed by the Liquid Propulsion Systems Centre (LPSC) at Mahendragiri near Tirunelveli, Tamil Nadu. The solid propellant motors are processed at Satish Dhawan Space Centre (SHAR)at Sriharikota near Chennai which also carries out launch operations. The PSLV was first launched on 20 September 1993. The first and second stages performed as expected, but an attitude control problem led to the collision of the second and third stages at separation, and the payload failed to reach orbit. After this initial setback, the PSLV successfully completed its second mission in 1994. The fourth launch of PSLV suffered a partial failure in 1997, leaving its payload in a lower than planned orbit. Since then, the PSLV has launched 24 times with no further failures. PSLV continues to support Indian and foreign satellite launches especially for low Earth orbit (LEO) satellites. It has undergone several improvements with each subsequent version, especially those involving thrust, efficiency as well as weight. In November 2013, it was used to launch the Mars Orbiter Mission, India’s first interplanetary probe. The PSLV has four stages using solid and liquid propulsion systems alternately. The first stage, one of the largest solid rocket motors in the world, carries 138 tonnes of hydroxyl-terminated polybutadiene (HTPB) bound propellant and develops a maximum thrust of about 4,800 kN. The 2.8-m diameter motor case is made of maraging steel and has an empty mass of 30,200 kg. Pitch and yaw control during first stage flight is provided by the Secondary Injection Thrust Vector Control System (SITVC), which injects an aqueous solution of strontium perchlorate into the nozzle to produce asymmetric thrust. The solution is stored in two cylindrical aluminum tanks strapped to the solid rocket motor and pressurized with nitrogen. Roll control is provided by two small liquid engines on opposite sides of the stage, the Roll Control Thrusters (RCT). On the PSLV and PSLV-XL, first stage thrust is augmented by six strap-on solid boosters. Four boosters are ground-lit and the remaining two ignite 25 seconds after launch. In the standard PSLV, each booster carries nine tonnes of propellant and produces 510 kN thrust. The PSLV-XL uses larger boosters which carry 12 tonnes of propellant and produce 719 kN thrust. Two strap-on boosters are equipped with SITVC for additional attitude control. The PSLV-CA uses no strap-on boosters. The second stage employs the Vikas engine and carries 41.5 tonnes (40 tonnes till C-5 mission) of liquid propellant – unsymmetrical dimethylhydrazine (UDMH) as fuel and nitrogen tetroxide (N2O4) as oxidizer. It generates a maximum thrust of 800 kN (724 till C-5 mission). The engine is hydraulically gimbaled (±4°) to provide pitch and yaw control, while roll control is provided by two hot gas reaction control motors. The third stage uses 7 tonnes of HTPB-based solid propellant and produces a maximum thrust of 240 kN. It has a Kevlar-polyamide fiber case and a submerged nozzle equipped with a flex-bearing-seal gimbaled nozzle (±2°) thrust-vector engine for pitch & yaw control. Roll control is provided by the fourth stage reaction control system (RCS). The fourth stage is powered by twin engines burning monomethylhydrazine (MMH) and mixed oxides of nitrogen (MON). Each engine generates 7.4 kN thrust and is gimbaled (±3°) to provide pitch, yaw & roll control during powered flight. Coast phase attitude control is provided by RCS. The stage carries 2,500 kg of propellant in the PSLV and PSLV-XL and 2,100 kg in the PSLV-CA. PSLV is developed with a group of wide-range control units. ISRO has envisaged a number of variants of PSLV to cater to different mission requirements. There are currently three operational versions of the PSLV — the standard (PSLV), the core-alone (PSLV-CA) without the six strap-on booster motors, and the (PSLV-XL) version, which carries more solid fuel in its strap-on motors than the standard version. These configurations provide wide variations in payload capabilities ranging from 3800 kg in LEO to 1800 kg in Sun synchronous orbit. The standard version of the PSLV has four stages using solid and liquid propulsion systems alternately and six strap-on boosters. It currently has capability to launch 1,678 kg to 622 km into Sun synchronous orbit. 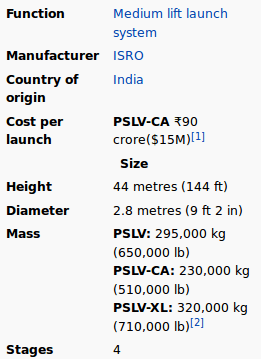 The PSLV-CA, CA meaning “Core Alone”, model premiered on 23 April 2007. The CA model does not include the six strap-on boosters used by the PSLV standard variant. Two small roll control modules and two first-stage motor control injection tanks were still attached to the side of the first stage. The fourth stage of the CA variant has 400 kg less propellant when compared to its standard version. It currently has capability to launch 1,100 kg to 622 km Sun synchronous orbit. PSLV-XL is the uprated version of Polar Satellite Launch Vehicle in its standard configuration boosted by more powerful, stretched strap-on boosters. Weighing 320 tonnes at lift-off, the vehicle uses larger strap-on motors (PSOM-XL) to achieve higher payload capability. PSOM-XL uses larger 13.5m, 12 tonnes of solid propellants instead of 9 tonnes used in the earlier configuration of PSLV. On 29 December 2005, ISRO successfully tested the improved version of strap-on booster for the PSLV. The first version of PSLV-XL was the launch of Chandrayaan-1 by PSLV-C11. The payload capability for this variant is 1800 kg compared to 1600 kg for the other variants. Other launches include the RISAT Radar Imaging Satellite and GSAT-12. ISRO is also considering the development of a three-stage version of the rocket without six strap-on boosters (with the second stage of the four-stage version removed) which will be capable of placing 500 kg to LEO. 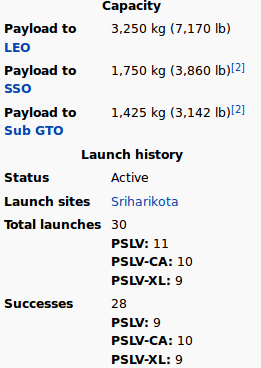 As of 10 July 2015 the PSLV has made 30 launches, with 28 successfully reaching their planned orbits, one outright failure and one partial failure. All launches have occurred from the Satish Dhawan Space Centre, known before 2002 as the Sriharikota Range.